Bayesian methods combine information available from data with any prior information available from expert knowledge. The Bayes linear approach follows this path, offering a quantitative structure for expressing beliefs, and systematic methods for adjusting these beliefs, given observational data. The methodology differs from the full Bayesian methodology in that it establishes simpler approaches to belief specification and analysis based around expectation judgements. 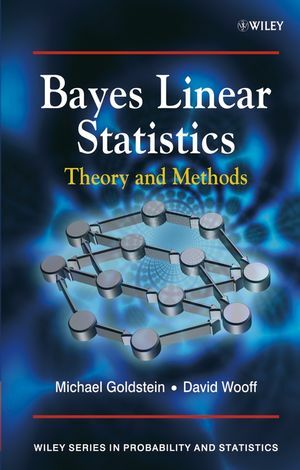 Bayes Linear Statistics presents an authoritative account of this approach, explaining the foundations, theory, methodology, and practicalities of this important field. The text provides a thorough coverage of Bayes linear analysis, from the development of the basic language to the collection of algebraic results needed for efficient implementation, with detailed practical examples. The importance of partial prior specifications for complex problems where it is difficult to supply a meaningful full prior probability specification. Simple ways to use partial prior specifications to adjust beliefs, given observations. Interpretative and diagnostic tools to display the implications of collections of belief statements, and to make stringent comparisons between expected and actual observations. General approaches to statistical modelling based upon partial exchangeability judgements. Bayes linear graphical models to represent and display partial belief specifications, organize computations, and display the results of analyses. Bayes Linear Statistics is essential reading for all statisticians concerned with the theory and practice of Bayesian methods. There is an accompanying website hosting free software and guides to the calculations within the book. Michael Goldstein has worked on and researched the Bayes linear approach for around 30 years, his general interests being in the foundations, methodology and applications of Bayesian/subjectivist approaches to statistics. He has an outstanding reputation as one of the most original thinkers in the field, and was a contributing author to Wiley’s “Encyclopedia of Statistical Sciences”. David Wooff has been involved in a long collaboration for over 20 years with Michael Goldstein and others on developing Bayes linear methods, his primary research interest being the general development and application of Bayes linear methodology. 1 The Bayes linear approach. 5 Partial Bayes linear analysis. 8 Learning about population variances. 10 Bayes linear graphical models. 11 Matrix algebra for implementing the theory. 12 Implementing Bayes linear statistics. C Software for Bayes linear computation. The Bayes Linear Methods Homepage Visit the author's website for a directory of links to the Bayes community.